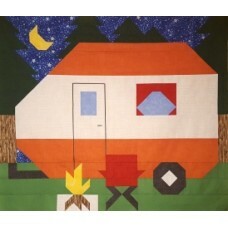 This is a quick and easy quilt project for the camper you care about. Counted Quilts are done in a stripped and pieced method making them great for beginning quilters. Originally a custom request by a customer who loves taking their old camping trailer to the woods for a fun filled time. Using charts you will be instructed on how many strips to cut for each color in 1-3 different widths, and then another set of charts for how many pieces, of varying length to cut from those strips. The shaping is done with quick corner half square triangles. 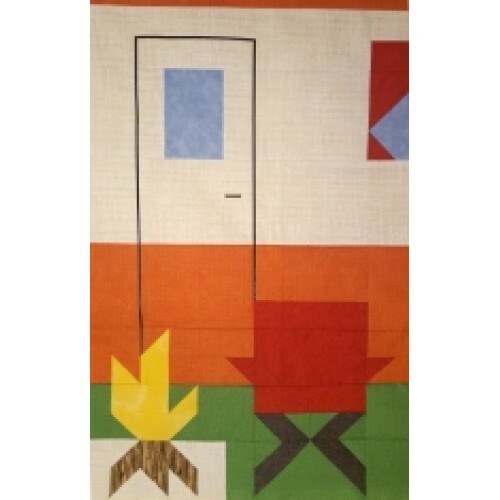 (You can search "Counted Quilts triangles" on YouTube for video instruction). This means that all the sewing is done with straight 1/4-inch seams. It is assembled following a full page labeled image of the quilt top. The accent line around the door is done with ribbon on the sample, but can also be done with a satin stitch or heavy quilting. The main instruction is for a 36x42 image, then there are additional measurements for a smaller 24x28, great for a wall hanging, and a larger 48x56. This larger size makes a good lap blanket, or you can border it for a larger bed. You are purchasing a 6 page COLOR pattern.